Hey all, I've decided mountin my winch to my existing bar is not gonna work without a crapload of work so i've decided to go with a tube bar. Anyone got any decent pics of theirs or one that they've seen? Wanna be able to fit my winch and still have good angles on the patrol. There is ALOT more work in making a tube bar then people think. I know its not gonna be easy. I want it strong enough to take a winch, yet not be over the top and keep good angles and the like. Thanks for the link spimon. Guts wrote: There is ALOT more work in making a tube bar then people think. all depends on how good you are with a 3d cad package. i've made tube bars for GQs, troopies, zooks, and jeeps. the longest one took 6 hours to make. most are quicker. its' all about measuring properly and planning the bar before you start welding. And a top notch tube bender? Found a style that i like! 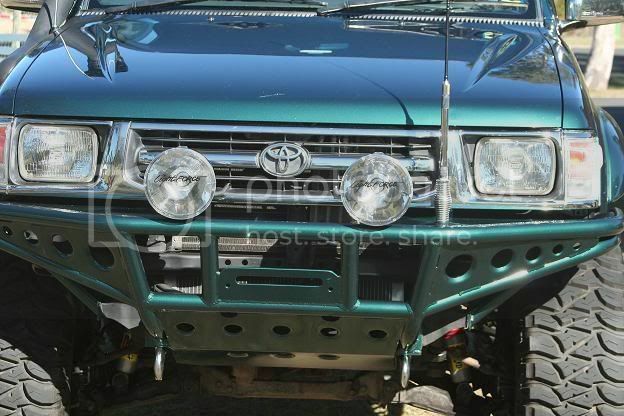 Its on the white hilux that featured in an old gold edition modified trucks special. The snake racing sponsored hilux, white thing? Its funny every tube bar I have seen where the maker says it was easy look like crap. To make a tube bar that looks good is NOT an easy job. The tube bar that is currently on the front of my lux took about 10 hours for 2 guys. 1 works with tube work everyday and has full electronic hydro bender etc. This bar I'm still not 100% happy with but its close. If you made one in 6 hours you didn't have many bends in it. Sorry mate but that what Guts was saying it looks cheap and homemade. This took a lot longer than a night and was done by a guy with experience with metalwork. Yeah Boofs yours is one of the few that I like, It's not one I'd have myself but it does look good.